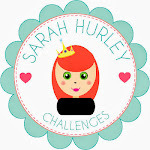 Sarah Hurley 365 (Formerly Sarah Hurley Challenges): Silhouette Scrapbook Page. As some of you know, a few of us Team Hurley girls went to the NEC in Birmingham to meet up with Sarah to discuss a lot of exciting new things happening in the very near future...watch this space! We also popped over to the Stitches Show and saw lots of luscious new pretties that are due to hit the shops soon, so start saving lol. One of my favourites were the new Shinhan Touch Pens, and I can't wait to get my grubby wee mitts on some of those, anyway I digress sorry! One of Sarah's lovely friends Diane took this amazing picture of all of us, and I just had to do a LO with it. I decided to use my Cameo as Sarah has amazing files in the Silhouette Store that are just perfect for scrapbooking. Here's how I made my LO. 1 I used the Square Page Mat from the Silhouette Store and cut it out full size on a sheet of DCWV paper. 2 I picked the Team Hurley Corporate Colour of mint green for the base for the mat, and decided to use one of Sarah's Stencils to make my own background. I used my favourite Distress Ink combo of Peacock Feathers and Picked Raspberry. 3 Being a stencil novice, I opted to use Scotch tape(washi would do too) and taped the edges of the stencil to my craft mat, and taped some scrap paper to the edges that were on the base layer. 4 Once I had moved my stencil around the base and covered it in pretty stars I popped my cut out Square Page Mat onto the base. 5 I love using arrows in my LO's and had to use the Hand Drawn Arrow Doodles on my page. I ungrouped the set, deleted the ones I didn't want to use and then resized the arrows using the Scale tool. And extra stars of course and the Doodle Stars are perfect for this. I separated them onto separate sides so I could make two different colours of arrows and stars. 6 And here is the finished LO! 7 And a close up to show the amount of dimension on the page. I hope you like my LO and it inspires you to get a favourite piccie from the box they are in or print one out from your phone and make a special page for it. Thanks for popping by, remember and look back soon for more inspirational posts from my immensely talented teamies.